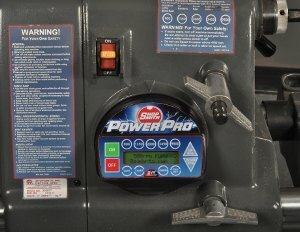 A quick look at its digital control panel will tell you that the PowerPro is NOT your typical power tool ! Start-up - The first time you start it each day, flipping the MARK V's Main switch to ON then depressing the Control Panel ON pad will bring your machine to life at a safe 500 RPM... and the display will confirm this setting. Or, if you prefer, you can select one of the five preset speeds at start-up. If your speed of choice exceeds 1500 RPMs, you will always be asked to CONFIRM your speed selection before the machine will start running. Speed Adjustments - From this point, you will always be able to adjust your speed up or down in as little as 1 RPM increments by simply depressing the UP or DOWN keypad arrows. Again, if your selected speed is in excess of 1500 RPMs, you will be asked to CONFIRM your setting before the machine will start to run. Don't know the correct speed for an operation? - No problem. Your PowerPro contains an extensive internal, electronic database of ideal speeds for virtually every imaginable operation. Here's how it works. Sawblade, Forstner Bit, Router Bit, etc. Given this information, your PowerPro will select the ideal speed for you in a matter of seconds, eliminating any guesswork or problems. Forward or reverse operation - When you need to perform bi-Directional sanding, under-the-workpiece shaping or with-the-grain cuts of any type, your PowerPro will accommodate you by electronically switching you to Reverse operation, at your command. Just depress FWD/REV keypad on the Control Panel , then CONFIRM to make the switch. Power Lockout - If you need to prevent the unauthorized use of your PowerPro by children or others, you can establish a multi-key security code that must be entered before your machine can be powered-up.